As it was a beautiful winter Sunday yesterday, I went for a walk. I decided to take a trip to the west of Dorchester, to the Hardy Monument, which stands on high ground. As you look south you can see right across the fields and valleys to the village of Abbotsbury to your right, with Portland and Weymouth occupying the left centre of your view and, in the distance to the left, the jutting promontory of White Nothe. I had thought the monument commemorated our famous Dorset author, but in fact it was erected in memory of his namesake, Nelson’s second-in-command at Trafalgar. He lived in the village of Portesham about a mile and a half to the south. I started off in that direction, and after meandering down through a small plantation and up the other side of a valley, I came to the ridge that overlooks the village. I decided to take the beautiful grassy descent, and as I did so I suddenly felt that I wanted to be 'given' a feeling of a past life. This is not so unusual, as I have been researching spontaneous past-life memories in adults for a new edition of The Big Book of the Soul. However I have never before felt such a sudden and strong desire to be given something tangible while in my normal, conscious state. I immediately got the sense of a big, powerful man wearing a heavy greatcoat and big, heavy boots. I could feel he was tired and hungry. And poor. I walked on for a few steps, just trying to get a sense of who this man was, and just as suddenly the name “William Darrow” flashed into my head, followed by the year 1812. I intuited that this was when he was born, and even before I could articulate in my head to ask for a year of death I got 1865. I also got the name Ann, which I presumed could have been his wife. I had no pen, paper or other means of making a record so, because my conventional memory is not what it was, I knew if I tried to get much more the new information would push out what I already had ;-) So I did not push too hard for more. Of course I also know how the mind can play tricks, so I was not at all confident that even what I had would actually mean anything. Nevertheless, because it seemed to me that it was the view down over the village that had prompted my vision, I assumed that I might have been sensing someone who was connected with Portesham itself. So I made my way to the church to see if I could find anything. I knew I would not be looking for a headstone of any size or expense, and there were precious few in the graveyard anyway. Nor could I find the name Darrow on any of the graves or notices inside the church, and there was no one about to ask for further details. When I got home I searched the internet for someone of that name connected to the village, and drew a complete blank. So I decided that, even if it was not just my imagination playing tricks, I was not going to be able to verify the information without more information or research or both. Then this morning I woke up early, remembering that these days of course census and other historical data is available on line. So I went to one of the many websites and, without paying a fee, this is what I discovered. Straight away I could see that both the 1851 and 1861 census showed only one entry for a William Darrow, so this was obviously not an especially common name. A good start. But when I clicked on the entry for the 1851 version it turned out he was apparently born in Norfolk about 1820. Not so good. Without much hope I then clicked on the entry for the 1861 version, expecting to find the same person. But this William Darrow appeared to be different. He lived in Warwickshire – ok, people move about – but what really made my spine tingle was when I read the year of birth... approximately 1811! How much of a coincidence could it be that I picked a name for whom there are so few entries, and then got the date right within one year – and possibly bang on, given that the record admits its entry is an approximation? Admittedly this person seemed to have had nothing to do with Portesham, but that was only an assumption I made at the time. It is well known that a particular view or situation can trigger a past-life memory, but it doesn't have to be the exact same thing, just something similar. Trekking across country, cold and tired, looking forward to some sort of shelter as he saw his destination come into view, might well have been a familiar story for William Darrow. And there was more to come. 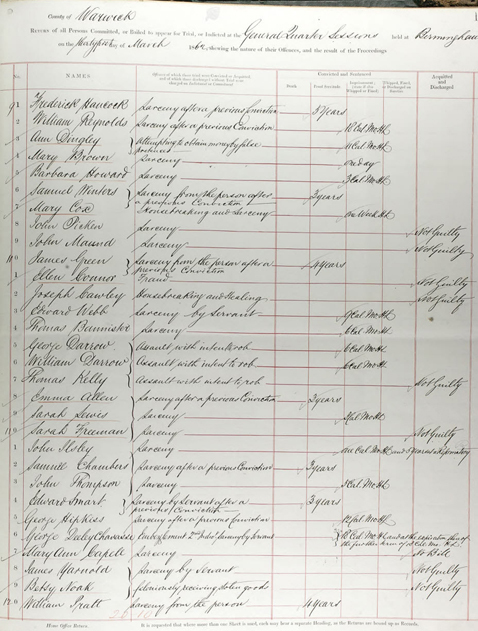 I saw that the criminal registers for 1791-1892 showed two entries for that name that occurred in exactly the same county, and with trials that took place a few years either side of the 1861 census in 1855 and 1862. If - and I accept it is still a very big if - but if this was a former incarnation of mine, what had I been up to? And what was my punishment? Entries 7 and 8 showed that George and William Darrow had been acquitted of 'horse stealing' at the quarterly sessions in Coventry. Who was George? A brother? Entries 15 and 16 showed that this time the pair had been less fortunate. They had been convicted of 'assault with intent to rob' at the quarterly sessions in Birmingham, and each sentenced to '6 calendar months'. Entry 17 also suggests they may have had an accomplice called Thomas Kelly who was found not guilty. 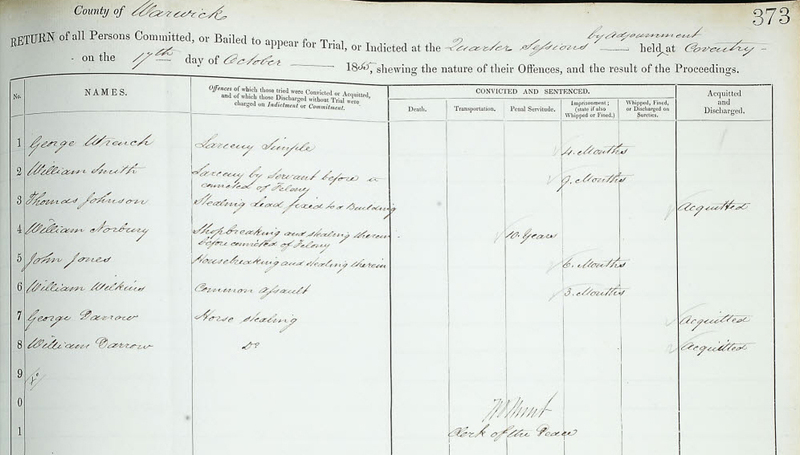 These criminal records for what must surely be the same person, living in Warwickshire in the right period, suggest that he may well have been poor, and forced to steal to make ends meet. Not so surprising for the poor people of the period, but interesting nevertheless. And the person I sensed was certainly big enough to have committed assault without much fear. To complete the story so far, the births/marriages/deaths index for 1837-1915 showed two entries under marriages, one in 1860 in Dudley and one in 1873 in Liverpool. It is possible that the first entry relates to the same person given the closeness of the location, but I could not obtain the name of the wife without paying a subscription. Under deaths the index shows only one entry, in Warrington in 1843, which cannot be the same person. But we have to remember that these records are not infallible or complete. To sum up, there were a maximum of only five possible William Darrow’s in roughly the right period for whom we have any records, only one of whom appears to have a birth date of close to, or maybe bang on, 1812. I am more than happy to hear from any statisticians, because I left all that behind at university a long time ago. But it seems to me this result is not entirely without interest. Further research may produce a year of death and possibly the name of a wife, which may or may not confirm the impressions I received. I am flat out on other work at the moment, but if anyone who has already paid for more in-depth search services has the time and inclination to check this out further, I would be delighted to hear from you. Almost unbelievably, although two options are given in these records, one of his possible spouses was recorded as Ann Shedden Dunn.